Bangkok has long been a special place for me. From close-by but exotic holiday destination to a place where Dad conducted business to an annual destination for Yui and I, it is now one of the places that I call home. Indeed, it is home to half of my extended family; my heart seldom wanders far. 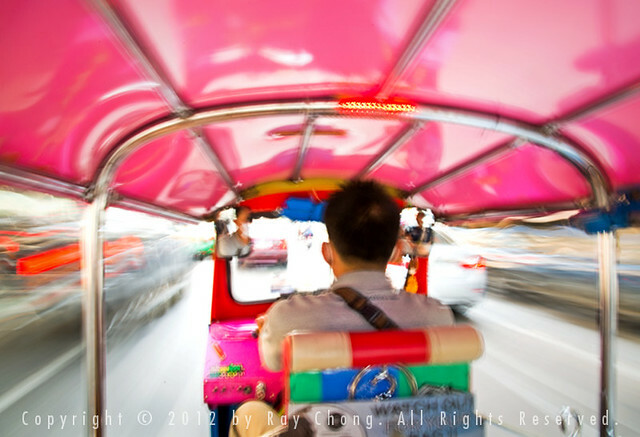 One of the unique modes of transportation in Thailand is the tuk-tuk (pronouced “took-took” with abbreviated double-O’s). Powered by a small gas engine, it is a gaily decorated three-wheeler with a covered cab, driver in front, passengers (usually 2-3 but I’ve seen as many as 6-7) in rear. A highly maneuverable small vehicle, it is the perfect solution to the helter-skelter bustle of Bangkok traffic where everything moves at one of two speeds – full tilt, or full standstill. 4/5 second at f/22, ISO 100. Nikon D800E + Nikkor AF-S 24-120mm f/4.